10 hp. diesel powered tracked excavator that will dig 5'8"(1715mm.). Width 28"-34" and weight of 2200 lbs(1000kg). Comes with 12" bucket. 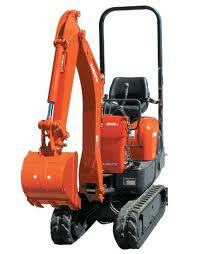 * Please call us for any questions on our 2200 lb mini excavator rentals in Calgary, Alberta.